Training events in Miami including Presentation Skills, Negotiation Skills, Consultative Selling Skills, Critical Thinking and Innovation, Workplace Harassment Training, Executive and Manager Leadership Training, Customer Service Training, Diversity Training, Time Management, Creating a Healthy Company Culture, and much more. According to a recent survey, 70% of Americans who regularly give presentations agree that presentation skills are critical to their success. 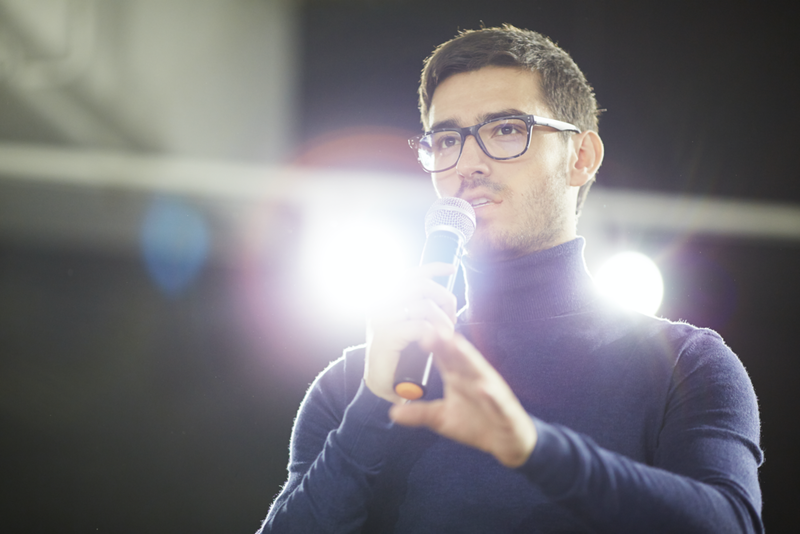 Are you under pressure to create a compelling, professional presentation? Do you lack the skills you need to make that happen? If so, then we have good news. What's the good news? Great presenters are well-trained, not born. Every person you've ever seen give a phenomenal presentation received high-level training in order to do it. That's right. It's a skill set, just like anything else. You weren't born knowing how to drive a car. You received training. Someone taught you the skills you need in order to drive. The same goes for giving presentations. Due to the amount of personal attention given to each student, this training is limited to 12 participants. Claim your spot today before it's sold out. *Pipeline Members: Call Sara Vallejo with 1BC Consulting at 786-408-0700 to receive a special discounted rate. The objective of our Flawless Presentations workshop is to improve your presentation skills when addressing any audience. The workshop focuses on teaching methods helpful for professional business communication, including preparation, structure, delivery, and strategy. The course also covers the powerful laws of influence and how to use visual aids to make yourself and message memorable. You will practice on the spot by preparing and delivering a real-life business presentation, ideally one which you will be delivering in a genuine business situation within 90 days of the workshop. The best part is that you get instant feedback! You will be taped during multiple deliveries of your presentations followed by one-on-one viewing sessions. This one-day skill-building workshop is highly participatory, personalized, and limited to a maximum of 12 people per session. Identify and effectively meet the needs of any audience. Structure a presentation that will maximize your message. Keep the audience engaged from start to finish. Overcome nervousness and project confidence. Understand and properly use non-verbal communication. 1) Four to five individually-taped exercises. The course design enables each participant to be videotaped in a variety of communication situations. Participants learn hands-on, by presenting and being critiqued, not just hearing lectures on theory. No other communication training system features this extensive use of tapings. 2) Individualized feedback coaching sessions. Up to the minute feedback that will immediately have a shift on your presentation style, and much much more. Identified and handled various types of audience questions. Overcome negative or distracting mannerisms. Gained tools on how to connect and engage with an audience. Set up a specific action plan to improve your image through presentations skills and practice. Used presentation media effectively (optional). Structured a presentation to give maximum impact with different audiences. Developed a system that works every time. Presented technical information in a clear, concise, and persuasive manner. Projected control and confidence through delivery skills. Enhanced voice projection, articulation, pacing, and fluency. Gained the ability to identify a variety of audience types and needs. Learned how to use more effective body language, eye contact, and gesturing. Learn from a top facilitator. As a master trainer, Oscar has traveled to over 834 cities in the United States and has conducted more than 3,000 workshops and seminars in eight countries. He has worked with over 65 Corporate Universities, helping them to build strong leaders and develop confident teams. He focuses on modern, evidence-based training methodologies that translate seamlessly from the classroom to the workplace. Here is what some of our past students have said. "Oscar was an outstanding Public Speaker and Coach. He had an amazing presence and was highly professional and has been a great asset to me as I've transitioned from Journalism into Public Speaking." "Oscar delivers the course in a very engaging manner because it is through engagement and participation that adults learn. I would highly recommend Oscar for any organization which wants to bring lasting results in terms of its performance and impact. He is an expert in helping people and organizations to self-discover and develop to a new level." "Oscar is a great public speaking coach. Thanks to his help and dedication, I was able to overcome some of the bad habits I have when doing public speaking engagements. In my field, it is imperative to be an excellent public speaker and communicate clearly and effectively. Thank you Oscar for helping me improve in this required skills I need to be able to succeed in my career." "I appreciated your seminar. I really enjoyed your knowledge, energy and confidence. I will use all the tools I learned for my classes I teach at the University and for my other business presentations that I will have in the future. Thanks a lot." "I really enjoyed the Presentations Workshop. It was informative, interactive and intense. Oscar was engaging, energetic and enthusiastic as well as knowledgeable about the subject matter. There was a notable change in my presentation skills from the first video to the last video. Thanks for a training that had real value." Take action. Sign up today. Claim your spot below and join a group of other growth-minded business professionals who are investing in their success and taking their presentation skills to the next level. Call Sara Vallejo with 1BC Consulting at 786-408-0700 to receive a special discounted rate.